ICAC hosted its fifth annual Holiday All-Nighter event at the shelter in Mason on December 17th and 18th, 2016, in hopes of getting every shelter animal a home for the holidays. 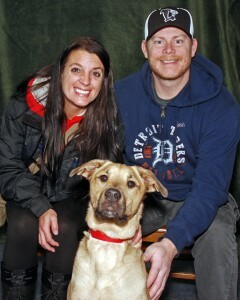 This year, it was a huge success for sixteen dogs and 28 cats that found their homes during the 17-hour event. Volunteers and staff kept the shelter open from 11 a.m. to 4 a.m., with adoption fees dropping throughout the night. Guests were treated to photos with ICAC mascot, Chippy, as well as holiday refreshments and a door prize raffle. Volunteers contributed over 154 hours to the event and showed their holiday spirit with a kennel decorating contest and a pajama party contest. holidays. Because the shelter has limited holiday hours, thereby limiting adoption opportunities and volunteer enrichment time, the holiday season is usually a difficult time for many of the animals in the shelter. But thanks to the outstanding Ingham County community, 44 animals were snuggled into their new homes for the holidays this year!